BLARG! : dream jobs part 2: ROCKET RACCOON!!! 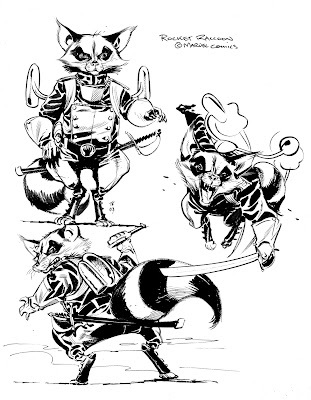 dream jobs part 2: ROCKET RACCOON!!! now here's the tricky part: publish in a different format (slightly bigger, slightly smaller-- doesn't matter) at about 44+ pages per book, and throw it onto a bookstore shelf next to "bone". the beauty of this is that at a different format you can trick parents into buying their kids comics ("this isn't comic book," they'll say. "comic books are bigger/smaller and have less pages and are crap. with this i can help my son/daughter to be interested in reading REAL books..."-- don't think it works? ask my folks about "asterix"), and the kids are happy 'cause they're reading a book about a raccoon with a jet pack*. win/win, and nary a cape (and all their accompanying baggage) in sight. i actually brought this up to someone at marvel when he was trying to offer me a job on something else (the something else didn't happen, but foot in the door, etc...) and wasn't completely shut down right away. 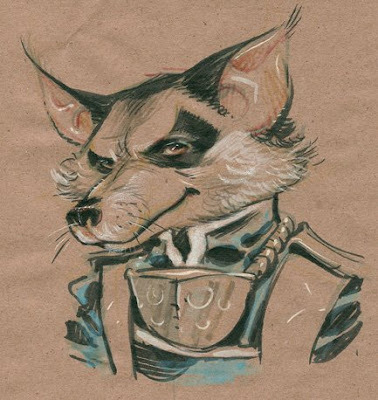 the crinkle in my master plan, though, is that in the time that it took me cook up this genius rocket raccoon comeback THEY BROUGHT THE CHARACTER BACK THEMSELVES! and worst of all for me, by all reports, they did a good job of it. rocky's now a member of the "guardians of the galaxy" and therefore well ensconced (albeit at an arm's length) in the same marvel universe i'd have further distanced him from. again because, purely from a bookstore marketing/trickery standpoint, it becomes significantly more difficult to trick parents into buying it if it's got spiderman plastered all over it. weirdest of all for me is that when they brought him back it was in an almost identical costume as the one i'd designed for him (though, admittedly i cribbed mine from garcia lopez's "tommy tomorrow" in "twilight"). so here's the new pitch: eventually guardians is going to end, right? well then maybe rocky goes home. and maybe things aren't as stable as he left them. maybe it's time to don the jet pack once again... and no parent would be the wiser. *yeah i know he had jet skates. i like jet packs better. EDIT: monique pointed out last night that the above picture of rocket might look a bit too lupine. i agree. here's the new one. Leave it to you to make me like a damn Raccoon with a Rocket. i can sooooooo relate! 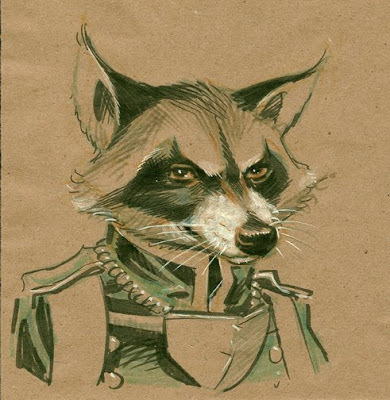 LOVE ROCKET RACCOON!! Man, if I had a jet-packed(skated?) raccoon in my hood, I'd leave out food for the fugger. When I was a kid, this comic and Atari Force were pretty fun...then again, nothing topped Thundaar. PS Really digging your work, Tom. Always have!